Instant downloads of all 942 LitChart PDFs (including Freakonomics). 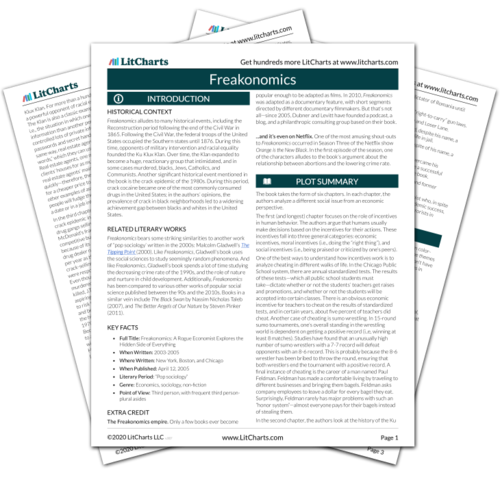 Welcome to the LitCharts study guide on Steven Levitt's Freakonomics. Created by the original team behind SparkNotes, LitCharts are the world's best literature guides. A concise biography of Steven Levitt plus historical and literary context for Freakonomics. A quick-reference summary: Freakonomics on a single page. In-depth summary and analysis of every Chapter of Freakonomics. Visual theme-tracking, too. Explanations, analysis, and visualizations of Freakonomics's themes. Freakonomics's important quotes, sortable by theme, character, or Chapter. Description, analysis, and timelines for Freakonomics's characters. Explanations of Freakonomics's symbols, and tracking of where they appear. An interactive data visualization of Freakonomics's plot and themes. Get the entire Freakonomics LitChart as a printable PDF. Freakonomics alludes to many historical events, including the Reconstruction period following the end of the Civil War in 1865. Following the Civil War, the federal troops of the United States occupied the Southern states until 1876. During this time, opponents of military intervention and racial equality founded the Ku Klux Klan. Over time, the Klan expanded to become a huge, reactionary group that intimidated, and in some cases murdered, blacks, Jews, Catholics, and Communists. Another significant historical event mentioned in the book is the crack epidemic of the 1980s. During this period, crack cocaine became one of the most commonly consumed drugs in the United States; in the authors’ opinions, the prevalence of crack in black neighborhoods led to a widening achievement gap between blacks and whites in the United States. Freakonomics bears some striking similarities to another work of “pop sociology’ written in the 2000s: Malcolm Gladwell’s The Tipping Point (2000). Like Freakonomics, Gladwell’s book uses the social sciences to study seemingly random phenomena. And like Freakonomics, Gladwell’s book spends a lot of time studying the decreasing crime rate of the 1990s, and the role of nature and nurture in child development. Additionally, Freakonomics has been compared to various other works of popular social science published between the 90s and the 2010s. Books in a similar vein include The Black Swan by Nassim Nicholas Taleb (2007), and The Better Angels of Our Nature by Steven Pinker (2011). The Freakonomics empire. Only a few books ever become popular enough to be adapted as films. In 2010, Freakonomics was adapted as a documentary feature, with short segments directed by different documentary filmmakers. But that’s not all—since 2005, Dubner and Levitt have founded a podcast, a blog, and a philanthropic consulting group based on their book. ...and it’s even on Netflix. One of the most amusing shout-outs to Freakonomics occurred in Season Three of the Netflix show Orange is the New Black. In the first episode of the season, one of the characters alludes to the book’s argument about the relationship between abortions and the lowering crime rate. Arn, Jackson. "Freakonomics." LitCharts. LitCharts LLC, 29 Nov 2016. Web. 20 Apr 2019. Arn, Jackson. "Freakonomics." LitCharts LLC, November 29, 2016. Retrieved April 20, 2019. https://www.litcharts.com/lit/freakonomics.